Ramadhan is a special month of the year for muslims throughout the world. During this month muslims fast from dawn to sunset everyday. It's time for inner reflection, self-control and devotion to God. In the month of ramadhan, we usually eat sweet for breaking our fast. Maybe because I'm far far away from my home country, Indonesia, I got excited to make anykind of Indonesian traditional dessert nowadays. 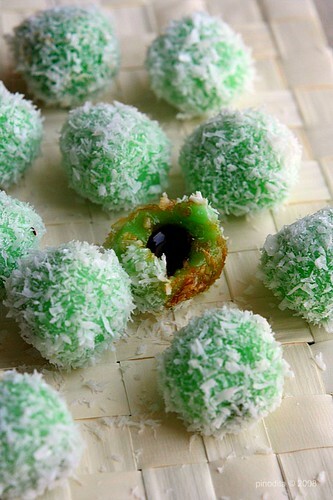 In Indonesia when ramadhan comes, we could find traditional desserts everywhere, especially in the street vendor. They sell variation of sweet before iftar. These kind of desserts known as jajan pasar (jajan means buying some food from the street vendor, pasar means market) because usually they sell food in the market instead of the street. In this special month, I'm going to make posts about some of Indonesian traditional food. Enjoy!! Dearest Lubna dan Yasmeen, here's my submission for "Joy from Fasting to Feasting". Ramadhan Kareem. This one is my family all time favorite :). 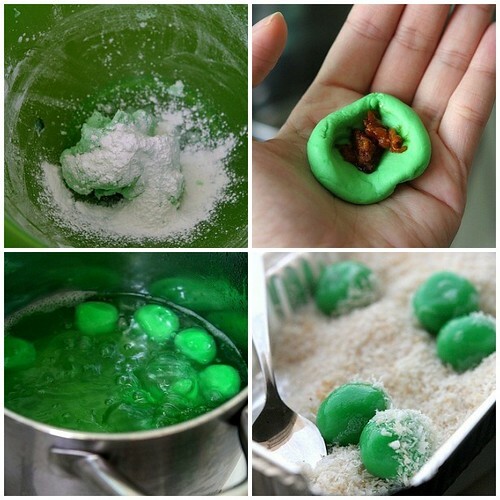 * Mix the glutinous rice powder with the lukewarm water and green food coloring into a firm but flexible dough. * Pull off one full teaspoon of the dough and shape it into a ball with approximately 1-inch in diameter. * Push a finger into the center of the ball to make a hole, and put in approximately ½ tsp. of the grated sugar. Seal, and roll it back into the ball shape with the palms of your hands. Prepare all the balls and set them aside. * Prepare a pot half filled with water and bring it to a boil. * Drop the balls into the boiling water. Remove the balls with a spoon once they float to the water surface and then roll the balls in the grated coconut. wah akhirnya bikin juga klepon Mak... nice pics ;) juga step bye stepnya :D..
mbak... i was bloghopping and landed at your blog. it is really interesting and i really love ur blog. it is also a good source to find indonesian recipes. 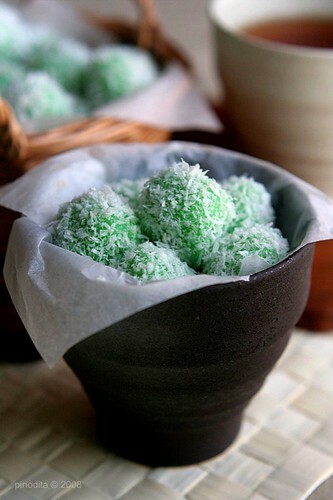 mbak, kalau diMalaysia, klepon is similar to onde-onde or buah melaka... nama aje yg beda. http://kitchenflavours.blogspot.com/2008/09/17-joy-from-fasting-to-feasting.html check this link. Waiting to see yummy dishes from u. Thank u again for using the logo. btw, suka banget foto yg pertama itu, cantik! just came back from bali where we got this from a lady who's carrying a huge basket while walking in the midday heat in the roads... delicious and have been looking for it's name! pinodita by Dita Wistarini is licensed under a Creative Commons Attribution-Noncommercial-No Derivative Works 3.0 Unported License.